Kids! It's almost Halloween, but this year your spooky shenanigans can last longer than October 31. 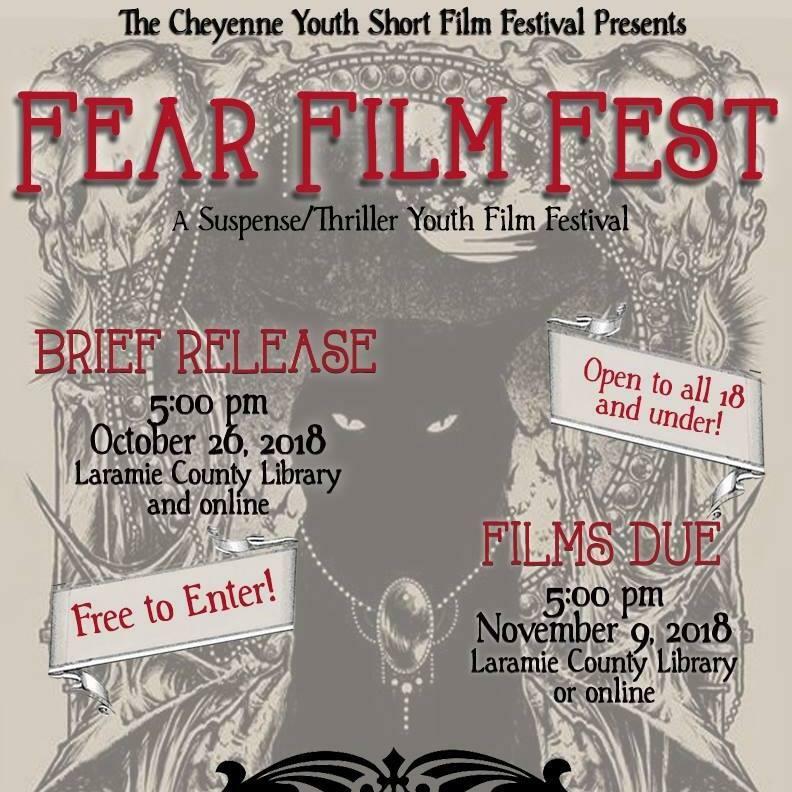 The Cheyenne Youth Short Film Festival presents the 2018 Fear Film Fest. Anyone under 18 from anywhere in Wyoming is invited to create their own suspense/thriller film. Emily Wood, a film festival board member, said one thing that makes this contest special is the parameters that the young filmmakers must follow. They have just two weeks to make films under seven minutes and they must include several secret elements. The exact details will be released this Friday at 5 p.m. at the Laramie County Public Library in Cheyenne and via Facebook. "I can just mention the general idea of what our secret elements are," said Wood. "We'll have a secret image that we'll reveal on Friday and a quote as well to include in the films." Wood made her own film back in high school and said it was a lot of fun. "You have two weeks to make a story, a whole background to that. And find a group of people to make that idea come to life," said Wood. "It's really rewarding to see that on the big screen and have a lot of other people come and watch it and support your film." Wood said participants don't need experience or special equipment. Past filmmakers have used smartphones to shoot their films. She said local libraries and schools often help by providing access to cameras and computers. Contestants are eligible for prizes and a chance to see their film on the big screen at the Atlas Theatre in Cheyenne on November 17. Is The Western Film Genre Dying? Western films are iconic like Stagecoach, The Magnificent Seven and High Noon. But has the Western genre lost its popularity in the modern days of the Avengers and superheroes? Wyoming Public Radio's Kamila Kudelska asked film critic, Dr. Andrew Patrick Nelson, whether the genre is really dying or just changing? First Sheridan Film Festival Hosts World Premiere Of "Miss Snake Charmer"
On October 5 through 7, the Sheridan WYO Film Festival will kick off its new event by showing Miss Snake Charmer. The world premiere will be in good company with 33 other films from all over the world. There were over 600 entrants from 54 countries. Science fiction movies in the 1950s often masked real fears and anxieties of the Cold War era. One of the common themes was a fear that technology would lead to the destruction of the planet. The Jackson Hole Wildlife Film Festival attracted an international audience this week for what many call the Oscars of nature film. Finalists included Wyoming filmmaker Shane Moore. Moore started making films when he was just 12 and growing up in Granite Creek, 30 miles southeast of Jackson. He met pioneers of nature shows, including the Wild Kingdom and Walt Disney, on his family ranch where they came to film. Moore was a finalist for two films, Born in China and Ghost of the Mountains. Both feature the rarely seen and rarely filmed snow leopard. The new play "The Big Heartless," premieres in Laramie this week. In it, playwright Dale Dunn explores the subjects of wolf reintroduction and reform boarding schools.